Germany agrees a €120m compensation deal after children in state and church care were abused for 25 years. 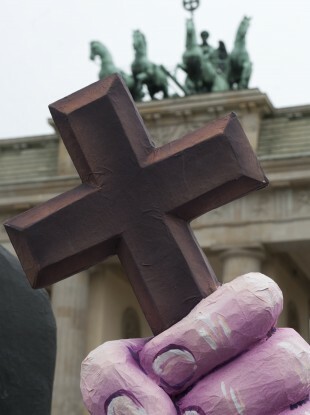 The hand of a character symbolising a nun holds a cross in front of the Brandenburg Gate during a demonstration against church abuse in Berlin earlier this year. THE GERMAN GOVERNMENT has agreed a €120m compensation package for victims of decades of abuse in the years after World War II, after acknowledging that many institutions subjected children in their care to ritual beatings and sexual assaults. Of the 800,000 children placed in foster care in the decades after the war, an estimated 30,000 were assaulted, forced into hard labour, and often left in solitary confinement. Many of the homes involved in the abuse were run by nuns and priests from Catholic and Protestant faiths on both sides of the East and West German divide. The fund was announced yesterday, the Independent reports, after two years of round-table discussions with victims groups and church leaders, led by former German parliamentary president Antje Vollmer. By agreeing to the compensation fund, Vollmer said, Germany had “recognised the suffering of the victims”. The fund will be contributed too by the Berlin government, authorities from the 16 provinces, and the churches who ran some of the homes involved. Deutsche Welle said that €20m would be set aside for the pensions of children who were forced into labour from the age of 14, while the outstanding €100m would go towards a straightforward compensation fund. Roughly 2,500 of the 30,000 victims have already come forward, it adds. If each of the 30,000 victims were to be given an award from the fund, each could expect to receive between €2,000 and €4,000 – an amount the groups said was “really humiliating”. The abuse scandal was exposed by Der Spiegel in 2003, when it said the abuse was akin to “the worst education practices of the Nazi era”. Email “Germany 'enslaved and abused' post-Nazi era children”. Feedback on “Germany 'enslaved and abused' post-Nazi era children”.